What does it mean to be rich? Certainly it means something different to me now than it did when I was a kid, or even when I was in my 20s. Now, in my late 30s, with two small kids, a head full of ideas, and a million things I want to do, I measure wealth in terms of time, health, and love, as cheesy as that might sound. But what about this word, rich? It doesn’t always refer to money (or time, health, or love). Rich is used to describe dark chocolate cakes and summer pies full of fruit picked only moments before it was baked. Rich is something that is dense, like nutrient-rich foods or deeply pigmented lipsticks, or it’s a gorgeous, melodic singing voice. Rich is a city full of history, a culture full of stories, and soil full of minerals that make vibrant flowers and vitamin-laden foods grow. 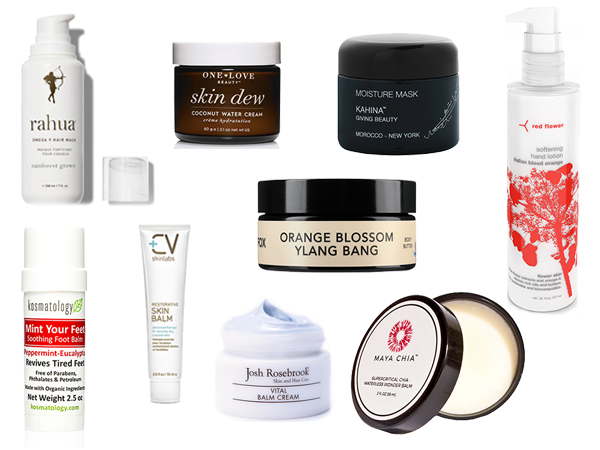 Rich is so many things, and in the winter, what I crave the most is rich skincare. My skin wants the dense nutrients, the valuable minerals, the lush hydration, and the heavy moisture. I need it to protect me from harsh winds and dry, indoor heat. I need rich skincare to soothe my face, soften my elbows and knees, and make my feet look something close to human. Every part of my body gets a richer product in winter, from hair to toes. Here’s a look at the products I actually use to nurture my skin all winter. My hair needs extra TLC in the winter. Dry air makes it flat and dull; hats make it frizzy and matted. Me not wanting to wash it on days when it’s below freezing make it oily. Enter Rahua’s Hair Masks. The vibrant Amazon Rainforest-sourced brand has two masks, actually, Omega 9 and Color Full, and even though I don’t color my hair (yet), I love to use the Color Full mask because I feel like it’s extra gentle and leaves my hair soft and shiny. I use it once a week in place of my regular conditioner, and savor the lush gardenia smell while I let it sit for 10 minutes in the shower. After I rinse, my hair is noticeably more cooperative and smooth. And I’ve had a little extra me-time. On my face, I like to rotate between several rich creams in the winter. Kahina Giving Beauty’s Moisture Mask is one of my all-time favorites, and I use it like a night cream instead of like a mask. It’s so yummy and thick, I would never want to take it off! I put a thin layer on my face after cleansing and toning, and wake up with skin so dewy I almost think it’s spring already. If I want something with a similar effect, but lighter for daytime, I go to One Love Organics’ Skin Dew Coconut Water Cream. It has the same feels-like-spring action the Kahina Moisture Mask has, but with a slightly thinner texture and a more matte finish perfect for under makeup. I use this one at night, too, when it’s not quite as cold outside. I love to layer it with OLO’s new Botanical E Youth Preservation Serum for extra oomph! If you feel like you need a winter balm, but still want something rich and creamy that doesn’t just go on like oil, Josh Rosebrook has concocted the perfect thing for you. His Vital Balm Cream is everything— literally— because it’s a balm and a cream. It’s the perfect winter catch-all. Sometimes I use it after Josh Rosebrook’s Advanced Hydration Mask, or, on lazy nights when I can barely wash my face, I’ve found the Vital Balm Cream to be the perfect solo-use product. Basically, if you know you only have time or energy or budget for one product, this one checks all the boxes. The first time I used Vital Balm Cream, I couldn’t believe the mirror when I woke up. It’s just like magic. I have recently fallen in love with Lilfox’s Orange Blossom Ylang Ylang Body Butter because, hello, it smells amazing, in addition to being so decadent and hydrating. I love to put it on at night after a warm shower, then cover up in my comfiest sweats to curl up and let the body butter really sink in. In the morning, not only do I still smell fabulous, but my skin is almost as soft as my kiddos’ skin. That’s really something, considering I have 30+ years of wear and tear and sun exposure on them! Anything that can restore my skin to child-like texture is a true miracle. My hands need extra love in the winter like you wouldn’t believe. I can always tell you when the weather dips below 60 degrees because I start getting dry skin on my hands, and when it dips below 40, they start to crack and bleed. Short of moving somewhere it’s sunny and warm all year round (and don’t think I haven’t thought of that!) Red Flower’s Softening Hand Lotion is my absolute solution. Wanderlust is my all-time favorite scent from this expertly-fragranced brand, and it truly leaves my hands in better shape than they’ve been in years. I love how, in addition to the fantastic moisture my hands get, I get a burst of the delicious scent when I apply the hand lotion, so it’s a multi-sensory experience. For boo-boos, cuts, and scrapes, I love the rich Restorative Skin Balm from CV Skinlabs, conveniently in a squeeze tube for on-the-go emergencies and lip balm use. I put it on my kids’ cheeks before we venture out in extra-cold weather, and again at night before they go to sleep. Elbows and knees — those of the whole family— get the decadent and much-loved Maya Chia’s Supercritical Chia Waterless Wonder Balm, which is rare in its thick, creamy consistency, unlike other balms that melt like oils in your finger tips. This one stays soft and dense in a way that lets you know you’re getting serious moisture for real, but it still absorbs beautifully. And if your feet don’t deserve their own dedicated balm, I don’t know what does! Perhaps the hardest working body part, my feet are dry and cracked all year, not just in the winter. My rich-and-fabulous foot pick? Kosmatolgy’s Mint Your Feet Soothing Foot Balm. It’s the first product I ever tried from this line that has fast become one of my all-time favorites, and I really don’t know how my feet would function without it. The peppermint also relaxes my tired muscles at the end of the day, and by the time spring and summer roll around, if I’ve used my Mint Your Feet stick regularly, I don’t have to be embarrassed to go out in sandals! That’s thinking way ahead, but it’s necessary! Anytime someone describes products like the ones I recommended, above, as “luxuries,” I think of how necessary it is to take care of one’s skin to protect it against the elements. When it’s cold and dry outside, our skin, hair, and faces need so much more care– it’s basically fundamental. That’s not to say that some of these decadent treats aren’t the lush, special delights that they are. That’s the beauty of it– necessities can still be fun, fragrant, and fabulous. Not to mention rich!